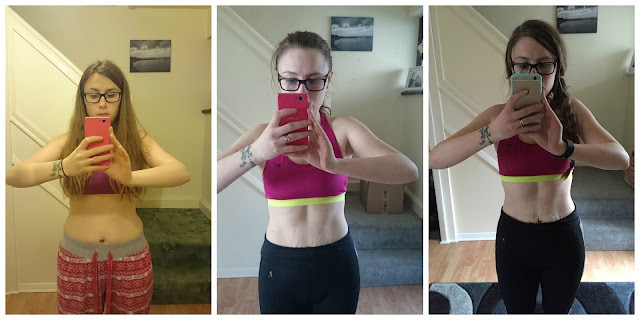 Last week I talked about trying the 3 week diet plan and how I came to the realisation that perhaps I don't need to be on such an extreme diet. I want to make progress in the right way. I've always been quite hard on myself when it comes to my image and my weight, realistically I know how I see myself is not how I appear to others but I just can't get myself comfortable in my own skin. Even last week I happened to mention that I didn't really see any difference in my body. I mean I've lost almost a stone in weight since January so you'd think that there would be a noticeable difference right? I've been taking photos to document my journey, up until this point I'd not put them together, only ever looked at them separately and I suppose that made me more blind to the reality that my body is infact changing. The photo below shows me in January, at the end of March and last week. Seeing all the images together like that showed me that I have made a lot more progress than I originally thought. I'm still not at the point where I can say I love my own body but my mindset is definitely heading in that direction. At the beginining of the year I was obssessed with the scales, I was weighing myself every day and getting frustrated when the numbers appearing were not what I wanted to see. Food was the enemy, I left myself feeling guilty if I ate anything 'bad' and it turned into a vicious cycle. 4 months on and my attitude towards the whole weight loss subject is definitely improving. I only weigh myself once a week and I'm having treats without beating myself up over it once they've been consumed. This week I put on 1lb and it is the first time I don't care that my weight has increased rather than decreased. Just looking at the picture above has given me a little boost in confidence. My efforts are working and I've just got to keep reminding myself that my weight isn't the be all and end all. So glad your attitude towards your weight has changed for the better. Weight loss is good, but when you still hate your body after you've lost considerable weight, you need to change your attitude.